BERKELEY, Calif. /California Newswire/ — Postdoctoral scholars at the University of California applaud today’s 3-1 decision from the National Labor Relations Board (NLRB) that will help expand the academic labor movement. Overturning a 2004 decision, the NLRB ruled that Graduate Teaching Assistants and Research Assistants at private universities are workers with organizing rights. Academic Student Employees at Columbia University and The New School in New York organized unions with the United Auto Workers (UAW) and filed the case after being denied the right to organize by their University Administrations. UAW has become a leader in organizing academic workers. Since 2010, UAW has organized nearly 12,000 higher education workers at public universities across the country. 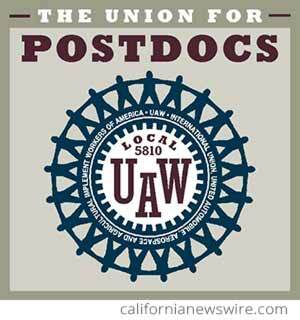 This month, postdoctoral scholars working at Lawrence Berkeley National Laboratory submitted a petition with the State’s Public Employment Relations Board to join UAW Local 5810. “UAW has been a trailblazer in academic organizing, and this ruling is a step towards improving conditions for vulnerable workers across the country. We are excited that academic workers now have the right to organize and negotiate for decent pay, protection against sexual harassment and improved working conditions,” said David McCleary, graduate student research assistant in Molecular and Cell Biology at UC Berkeley and President of UAW 2865, which represents 14,000 teaching assistants, readers and tutors across the UC system. Academic workers and postdocs make major contributions to research grant applications that bring in nearly $6 billion each year to UC and help advance cures for cancer, clean energy technology and more. Despite their enormous contributions to research institutions and scientific progress, earlier this year, nine private research universities filed an amicus brief with the NLRB in support of the 2004 decision. Yale, Brown, Cornell, Dartmouth, Harvard, MIT, the University of Pennsylvania, Princeton and Stanford were unsuccessful in their arguments, and Teaching and Research Assistants at private institutions are now legally able to organize. MEDIA Contact: Neal Sweeney, (831) 334-3367. Editorial Note: content based on press release as provided by the UAW and was not originated by this website, CaliforniaNewswire.com – a publication of Neotrope®.